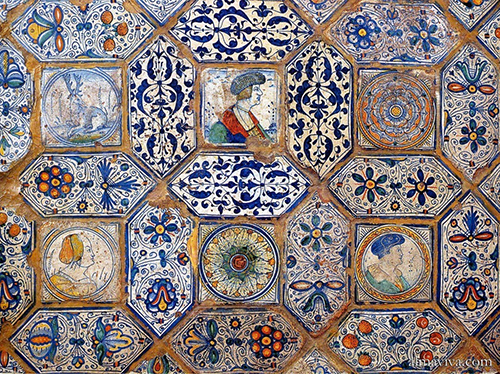 Majolica tiles from Italy. 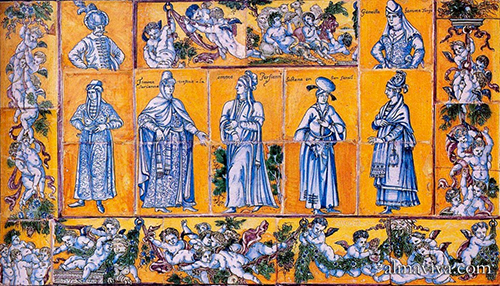 Replica ceramic tiles of the Renaissance. 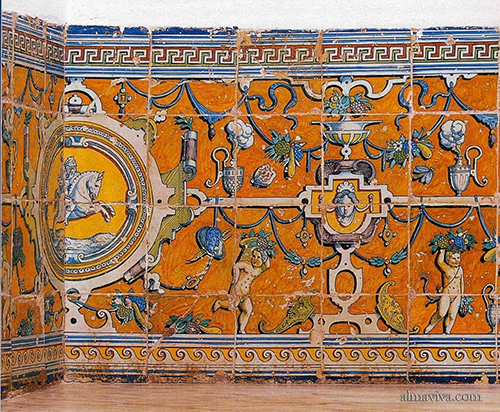 The Almaviva tile studio manufactures custom-made replicas of tin-glazed tiles of the Italian Renaissance. Our tiles are handmade and hand-painted using the traditional techniques of majolica: each tile is unique. Often times, we work in the context of restoration projects; we know how to reproduce the imperfections observed on antique tiles. Over 20 years of activity, our tile studio has gathered archives with hundreds of images of majolica tiles; they can serve as inspiration for new projects. Our showroom is in the centre of Paris, in the Montparnasse district. In Italy, during the 15 th century, the Florentine family Della Robbia developed a durable white tin-based enamel on which decorations could be painted. This technique, first used to protect terracotta sculptures, was used in the 1450s to decorate the floor and ceiling of the studiolo of the palace of Piero di Cosimo de’ Medici in Florence. Inspired by this illustrious example, the technique of glazed earthenware was quickly appropriated by Italian potters who used it extensively to decorate with bright colours palaces and churches, such as in Florence, Venice (San Sebastiano church), Bologna, or Siena (palazzo Petrucci). At that time, indeed, Italy is in full artistic development (the so-called “Renaissance” period), and decorations with majolica painted in rich polichrome compositions, become very sophisticated. Arrangements of “grotesque” ornaments became popular thanks to Raphael, especially in his native region (Urbino and Casteldurante) where they are known as “raffaellesche”. Born in Italy, this style spread throughout Europe with the installation, around 1500, of Italian majolica potters in Seville and in Antwerp. In France, the first majolica painter was Masséot Abaquesne, active in Rouen in the 1550s. Two French noble statesmen commissioned him majolica pavements for their castles of Ecouen and of La Batie d’Urfé. One is still in place (National Museum of the Renaissance, in Ecouen), the second is partly exhibited in the Louvre Museum.